﻿ Forever Blessed Hotel, Palawan | FROM $32 - SAVE ON AGODA! "Good place to stay on few days." Have a question for Forever Blessed Hotel? "The staff were incredibly accomodating and helpful." "Rooms and bathrooms were clean and spacious." "I will be back and I will definitely stay here"
Built in 2014, Forever Blessed Hotel is a distinct addition to Palawan and a smart choice for travelers. The hotel lies 0.1 km from the city center and provides accessibility to important town facilities. With its convenient location, the hotel offers easy access to the city's must-see destinations. At Forever Blessed Hotel, the excellent service and superior facilities make for an unforgettable stay. The hotel provides free Wi-Fi in all rooms, convenience store, gift/souvenir shop, express check-in/check-out, luggage storage to ensure our guests the greatest comfort. All guest accommodations feature thoughtful amenities to ensure an unparalleled sense of comfort. Besides, the hotel's host of recreational offerings ensures you have plenty to do during your stay. 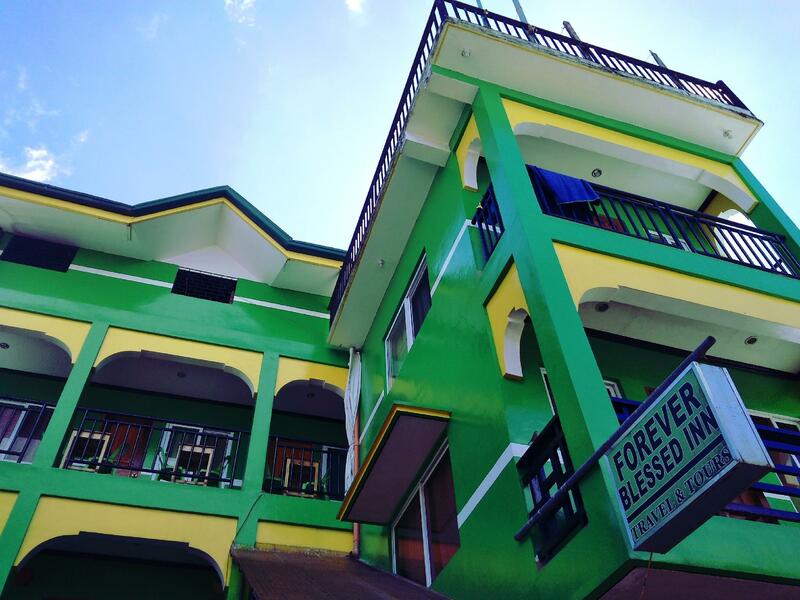 Whatever your purpose of visit, Forever Blessed Hotel is an excellent choice for your stay in Palawan. "the place is located at the town center- near the grocery sh..."
We stayed for 4 nights. But room cleaning is one time. They will not change the towels. Many mite in the bed. Many mite were attacked by us. There is no TV in the room, there is no refrigerator. The reception staff is not kindly. They did not say Greeting. So traveling moods are spoiled. Check in was a breeze and you are very close to the water and all the nightlife. The staff is very friendly and helpful. They provide tea and coffee for you every morning right outside your door and even provide a big container of hot water. Room was a bit small but it was ok. Bathroom was dated but suited our needs. They do not allow unregistered guests which means this place is safer than others. We would stay here again for sure. Thank you. be aware that the rooms lead directly into the street, not through reception and there is no guard there, so anyone can just enter the "hotel" and in your room, I was really worried about my belongings, also there I've seen the sourest hotel owners ever, not a single smile was given on my entire stay there i was absolutely amazed how someone that works in the hospitality business can be so inhospitable, every time i asked about something it seemed like i've interrupted kim jong un speech or something, if you don't care about sour faces and don't carry valuable stuff with you this could be a good place. Everything about the forever blessed innis great, the location, bed, bathroom, rooftop, service... but it’s a bay part of El Nido. There is lots of antics going on, including constant banging of things at 3am - very loudly. Otherwise amazing! I have stayed at Forever Bless Hotel for 4 nights. The color of the house is very easy to recognize, even from the port. The room is very basic but it has beautiful view to the sea. I stayed at room No.12 on the 3rd floor. The hotel is in the middle of everything, near sea-port for tourist boats, near many good restaurants like Sea Jane, Angel Wish. Highly recommend it to everyone who want to discover Eldino, prefer rooms No.10, 11, 12 and 14 on the 3rd floor with sea-view balcony. We were able to book a tour through them and it was really good. We talked to others about their tours and they had some complaints but we didn’t have any complaints! We bought water from the front desk as well and were able to get a refresh on our towels. Loved the hot coffee in the morning that was always ready for us. The staff was so friendly and the location was the best, walking distance from all the great bars and restaurants, we never took a tricycle at all. Bathroom was clean and spacious and AC worked perfectly. They also had a fan which we used some nights instead. Also it was a real treat to be able to walk up on the roof of the building to see the view of the town and the ocean. I would stay here again! Basic room. Bed was semi-comfy (foam mattress). Bathroom was wet-style, so everything got wet when showering. We had a doorstop to keep bathroom door open so it would dry out faster. Bright in the room (curtains didn't block much light at all). Hung a towel over curtains to block more light. Wore eye mask to sleep. Wifi didn't work for first full day (and staff didn't care either). Needs more outlets (especially by beds). Hot water and shower pressure was good. Close to boats for day tours. Not worth $34 per night though. It's a no thrills place but is perfect for what you pay. Has private bathroom and AC. The location is right in the heart of El Nido, just around the corner from Happiness Bar and practically right in the harbor. Their isn't breakfast but there is a bunch of cafes just around the corner and an amazing vegan spot down the street. I'd definitely go back! The room lacks furniture and we had wires sticking out of the wall. It was very clean, with a good shower and working AC. The main problem was the noise. One morning they started banging new tiles on the floor above us before 7am! There were building works going on at the hotel the whole day - impossible to relax in the room. Also, a lot of noise from the street. The hotel is in the centre therefore to much noise. Staff is friendly and helpful. If you don't like hens this is not the place to be. The staff was helpful and gave me the spray. I have slept with the hens only for 1 night, fortunately. The air con was working only at the maximum otherwise it wasn't working therefore I couldn't sleep with it. New Sheets and towels on the third day. Tea and coffee every day for free. 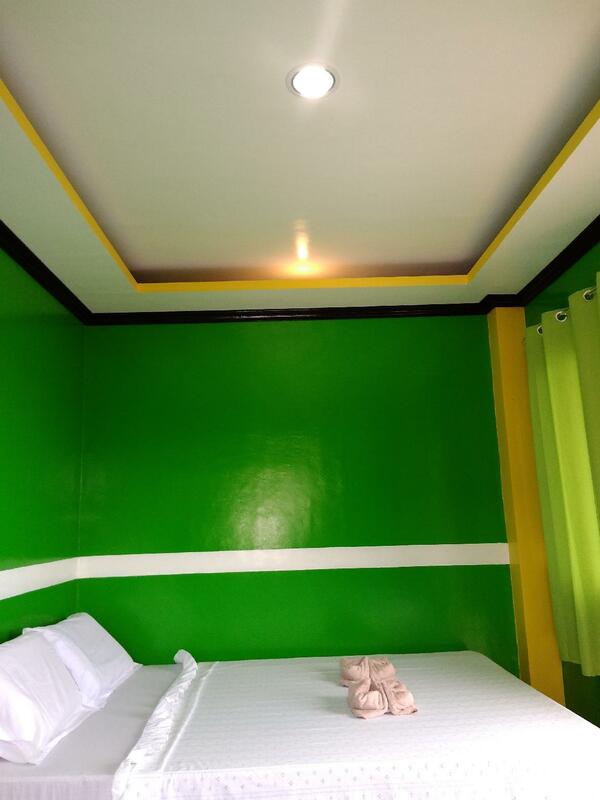 at the center of El nido, clean room. The sink needs to be drained because it was clogged. It think there was bed mites. It was very clean and cheap. Location is very good you can walk to eat go out and activity place is very near from hotel. I stayed room 4, air conditioner was not powerful. even I operate it for over 2 hours, I should sweat. But I asked fan and staff gave us very kindly. Toilet seem just renovated so its new. Close to mango shop 120 ps per kilo. They came to make up the bed but not give new towels or fill the tissue. Would be nice to come back with nice dry towel. Hot water at the front of the room in the morning. Affordable price near beach. Owner is kind. It is a few steps to the beach where boats will be waiting for you to take you to the lagoons of El Nido. Also, the place is located at the town center- near the grocery shops, the church, and the restos that serve your choice of yummy seafood!! It sells the cheapest bottled water @ P30 per liter. The staff made the cheapest arrangements for our Tour A and Tour C as well as our transpo back to Puerto Princesa Airport. We stayed for 5 days at the hotel because we liked it. Due to its proximity, for 2 nights we ordered seafood at a nearby resto and the food was delivered at our doorstep!! They serve hot water, coffee and milo drink once for bfast and another for afternoon snacks. For its amenities, it has whole day electricity, free wifi, aircon, queen-sized bed (where my husband, our 10 y/o son, and I fitted comfortably), shower, bidet (yey! ), and very soft bed and pillows. I cannot say anything negative about Forever Blessed. I am hoping we can come visit them again. Flight was delayed by 3 hours, emailed the owner to advise on new arrival time. Arrived at 11.55pm to find the placed closed, it is a shop with some rooms above accessed from the street. After a 12 hour journey this was not what was expected. Found a hotel further up the street and had to check in there for the night, when I went to the place in the morning I was told by the owner that he was tired and went to bed, it wasn’t his fault that the flight was delayed. After a heated discussion about the total lack of any type of customer care or commitment his wife agreed to reimburse for the night we could not get access. This place is right in the middle of town but it is at the bottom of the scale in everything except price where it is totally overpriced for the standard of accommodation.